Keo Dara with IBJ Lawyer Sim Dalis. 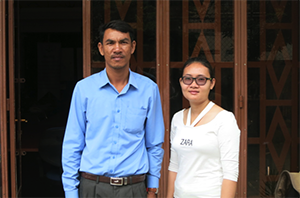 Keo Dara lives in a small village in the Takeo Province of southwest Cambodia with his wife and nine year old son. He is well liked in his community, as he is both the director and a teacher at the local primary school. Dara cares deeply about his students and their wellbeing. Therefore, when he found out that fifty-five year old Sok Davuth had attempted to sell his students narcotics, he promptly alerted the authorities. Unfortunately, it took many reports by Dara to the police until action was taken against Sok Davuth. On June 1, 2015, the police arrived at Dara’s home and asked him to come into the station to help clarify the details of the case. Happy to oblige, Dara went willingly with the police to the station. He thought that he was going to identify Sok Davuth as a drug trafficker to children and provide more evidence the police. Instead, he was arrested under Chapter X, Section 6 of the Cambodian Law on the Control of Drugs as an accomplice to Davuth and charged with drug trafficking! While in disbelief that he was arrested under drug trafficking charges, Dara was confident that he would be released soon as he knew he was innocent. However, after five days in police custody, his confidence began to waver upon realization that he was facing up to five years in prison. Incredibly frightened and overwhelmed when police sent him to prison to await further discretion by the prosecutor, Dara was unsure of what to do and who to contact. He began to feel hopeless in the small room alongside 80 other prisoners. Luckily, he saw one of IBJ’s posters in the courthouse, which explained how to get in contact with one of their lawyers. Dara called the office and Mr. Ly Kosal, IBJ’s provincial lawyer in Takeo, agreed to take the case and began to prepare for Dara’s defense. Dara was relieved and hopeful that IBJ’s representation would lead to the dropping of his charges so that he could return home to his wife, son, and students. Within five days, Kosal prepared testimonies from local leaders that showed Dara’s good standing in the community and presented that evidence alongside the fact that the police had no evidence against Dara. After hearing Kosal’s well-prepared defense, the prosecutor dropped all charges against Dara and he was released from prison. Dara is grateful for IBJ’s willingness to represent him and the successful outcome of his release. However, this is not always the case. Many Cambodians face several months of pretrial detention on charges as weak as those leveled against Dara due to lack of representation. IBJ continues to focus on reaching defendants as quickly as possible in order reduce prison overcrowding, expedite cases that congest the court system, and return innocent individuals to their family, friends, and community.